‘George’ was born in Hackney, London, in 1886. His father Alfred (1857-1939), a gardener, and former coachman, was born in Clewer, but his mother Ellen James (1862-1950) came from Sandhurst in Kent. They married in Bermondsey in 1883 and George was the eldest of their five surviving children. George had already left Datchet before the outbreak of war. We don’t yet know how he was earning a living but it was very possibly connected with horses. He enlisted in Reading and became Lance Corporal 15585 in the 15th (The King’s) Hussars, a cavalry regiment which remained on the Western Front throughout the war. (A Lance Corporal is the lowest-ranking non-commissioned officer in the Army, between private and corporal.) He entered the war in France on 8 June 1915. From April 1915, the 15th had been part of the 9th Cavalry Brigade, 1st Cavalry Division. They participated in most of the major actions where cavalry were used but they were also used as dismounted troops and served effectively as infantry. In March 1916, nine months after first going to war, and after the Battles of Frezenberg and Bellewaarde, George Slade married Avis Amelia Brinsden in Wantage, Berkshire. They were both about 30 years old. Avis was from Donington Castle, Wiltshire, and had worked her way up from being a domestic servant at the White House, Twyford, in 1901, to the position of cook at Upton Lodge, Henley-on-Thames in 1911. The 15th were involved in many battles and engagements including Flers-Courcelette, The First Battle of the Scarpe, The Tank Attack, The Capture of Bourlon Wood, The German Counter Attacks and the Battle of St Quentin. George was buried at Ohrdruf prisoners of war cemetery, Thuringia, but in 1922-23 it was decided that the graves of Commonwealth servicemen who had died all over Germany should be brought together into four permanent cemeteries. Niederzwehren was one of those and in the following four years, more than 1,500 graves were brought into the cemetery from 190 burial grounds in Baden, Bavaria, Hanover, Hesse and Saxony. 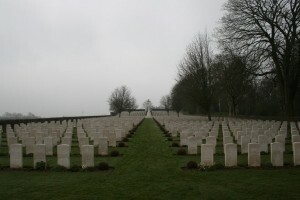 Some 107 graves, dating between 1915-1918, were moved from Ohrdruf, including George’s grave. 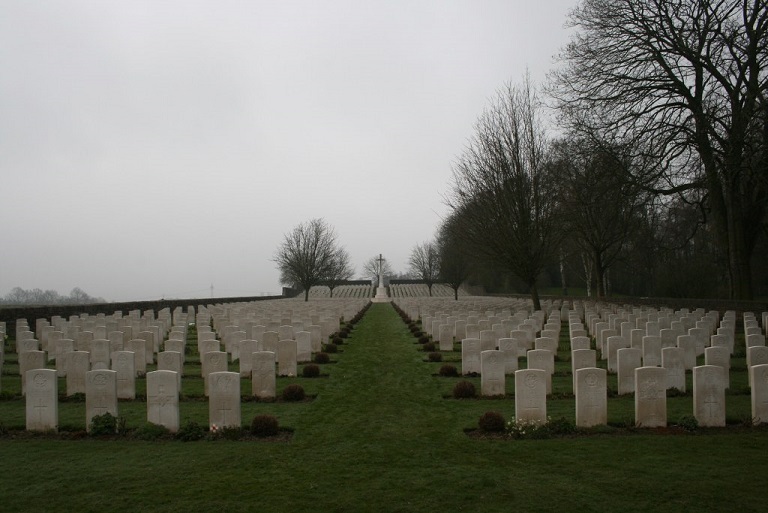 There are now 1,796 WWI servicemen buried or commemorated in the Commonwealth plot at Niederzwehren. The epitaph on George’s headstone, chosen by his wife, read ‘greater love hath no man than this’. Avis’s last known address was West Ilsley, Newbury, Berks. George’s brother, Albert Edward Slade, who was married and living in Richmond before the war, also fought but survived. Ernest George Slade was awarded the Victory Medal, British Medal and 15 Star. 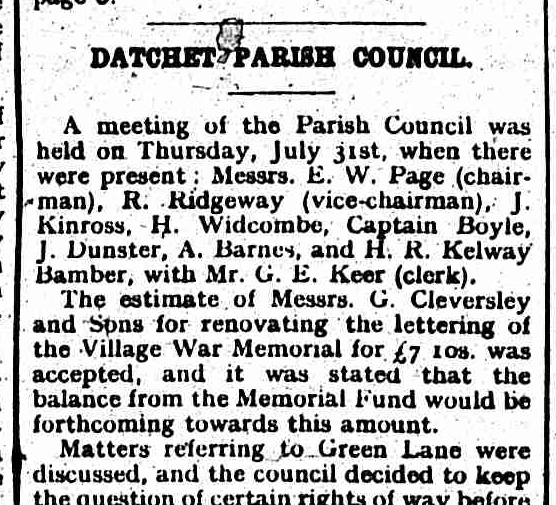 His is the last name on Datchet’s WWI memorial on the village green, listed out of alphabetical order. When the memorial was unveiled in May 1920, there were just 53 names. This is confirmed by the newspaper article on the left, below, which appeared in the Slough Observer, 8 May 1920. George’s name is the 54th on the list and was added at some point after this date. His name is in the correct alphabetical order in the War Roll in St Mary’s Church which is more recent than the memorial on The Green. 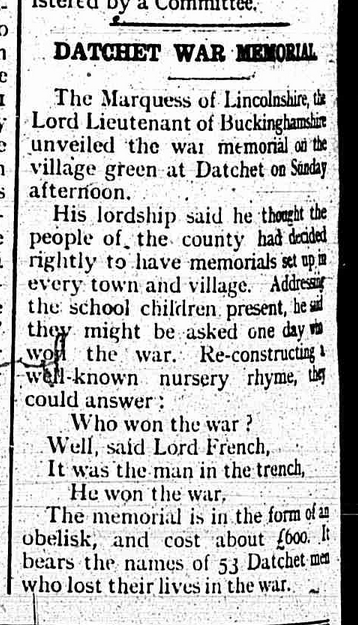 In 1924, a decision was taken to renovate the lettering on the memorial, see article on the right, from the Slough Observer, 9 August 1924. 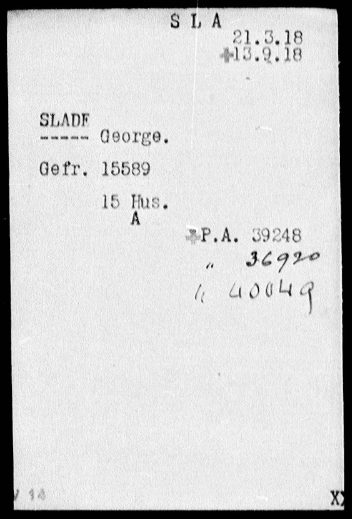 George’s parents and his sister, Ada Garrard, nee Slade, are buried in Datchet Cemetery.